Aksel has lead us into almost every community we have visited so far and also took us into Gjoa Haven this week. 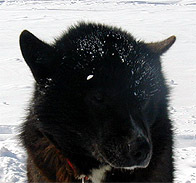 For being the best "getting into town" lead dog also gets the Polar Husky star of this week. Aksel is Mille's main lead dog. He loves to hunt, has a fast pace, and never gets in trouble with other dogs. Aksel can be moody, but is wise and very honest, making him one of Mille's favorites. We knew it was a long shot the morning we set out for Gjoa Haven a little more than 40 miles away, (Mille had actually measured the distance about 10 miles short on Easter morning) but we decided to go for it anyway. The light that day was very low - meaning it is difficult to distinguish any landmarks. Whether the object is a few feet or long distance away, we were left with the feeling that earth and sky had combined into one. A little over ten miles from town, we started seeing large rocks and something tall, like a tower floating in the air. Maybe the dogs couldn't yet, but we could almost smell coffee and perhaps even a fresh salad! However, it was still a long way though, and traveling at 4 miles an hour, it seemed to be an infinite distance away. You might know the feeling - like when you are walking, you really want to get to a specific place and you wonder if you are even getting closer. At one time, the point of rocks disappeared and we almost decided to just make camp, but instead, Mille and Aksel went into lead, with Mille constantly yelling out, "Town Aksel, Town.” Unfortunately with the wind at our backs, Aksel wasn't convinced, and it wasn’t until we all had almost given up, when suddenly, the town seemed to jump out of nowhere and stand right in front of us. The fog separated and there it was: neat little harbor. This harbor is actually "world famous!” On August 28, 1903 the Norwegian explorer Roald Amundsen and his six crew members docked their mighty ship "the Gjoa" here in the perfectly shaped inlet nestled on the southeast coast of King William Island. They were on a quest to find the Northwest Passage and to locate the magnetic North Pole, which at that time, was less than 90 miles from here! (The magnetic North Pole is actually in constant motion). Amundsen and his crew ended up spending more than two years on King William Island with the Nattilik Inuit People, who taught Amundsen and his men their traditional ways of hunting, fishing, and traveling. The Gjoa reached Nome, Alaska, in 1906, becoming the first ship to navigate the Northwest Passage and completing the elusive search that had been ongoing for more than 300 years!!! The first ship from Europe to head out looking for the Northwest Passage, which was believed to possibly be a shortcut to the far East and great trading opportunities, was Martin Frobisher in 1576. 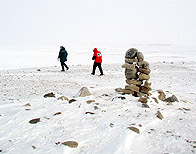 One of the most famous expeditions "The Franklin Expedition" had earlier met its final fate here on King William’s Island. In 1846, the ships of the Franklin Expedition got caught in the ice northwest of King William Island in Terror Bay. The crew abandoned the ships in the summer of 1847 after being stranded for 18 months. That year is known here as "the year summer never came north." On Franklin’s order, the desperate men pulled sleds filled with fine china and books, instead of supplies, and their effort to reach the South was useless. All 105 men died of starvation and scurvy. Countless books have been written on the Franklin story and the search that followed (which has yet to end as many people are still searching for Franklin’s grave). The fate of Franklin has passed into northern mythology. Our great hosts Jan and Rita Becker in front of down town Gjoa Haven. We felt pretty much the same Tuesday evening arriving here. As we mushed in, we were met by people in the harbor, and actually even saw several that we had met earlier in Baker Lake who had traveled here by snow mobile. We staked the dogs out in the bottom of the bay and were taken to the house of our generous hosts: Rita and Jan Becker. Jan and Rita have lived many places like Holland where Jan was born to Bangkok in Thailand. Two years ago their adventurous spirits brought them here to Gjoa Haven where Jan teaches grade 8 and Rita works for the Nunavut Water Board. They are great people and allowed us to stay with them for the past 4 days (we have been waiting for our photographer Gordon Wiltsie who will be traveling with us from here to Taloyoak). They have truly made us feel at home. We had met Jan and Rita some days earlier, when they came snowmobiling along with their friend Amy to go camping and ice fishing on the Back River and invited us to stay with them once in Gjoa Haven. They had returned from fishing when we arrived and had even had good luck - a couple of beautiful three foot long Lake Trout - which we enjoyed one night for dinner: YUMMY! Now we know first hand why the Inuktitut name Gjoa Haven Uqsuqtuuq, "the place of plenty of fish fat." Over the next couple of weeks with the arrival of the longer days (we have almost 18 hours of light now) and warmer temperatures, most people in Gjoa Haven will be heading out to catch some fish. This is the beginning of spring - or Upinngaksaaq as it is called in Inuktitut. Spring is not like in Denmark where Mille is from or in Minnesota where Paul grew up which is characterized by the first flowers popping out of the ground in early April. It will still be many weeks before anyone can see the ground around here. Instead, you know it is Spring when people start heading out on the land, fishing and to traveling to other communities to visit friends and relatives. This is the way it has always been! The life of an Inuit has always, and still very much, follows the four seasons of the year. Even though not quite as easy to separate as further south in more temperate climates, the arctic year is made up by four seasons. Winter is obviously long, summer is very short, and the seasons in between are more often called "warm-up" and "freeze-up" than spring and fall. The Inuit cycle of seasons is made up of 6 seasons! Upirngaksaaq (early Spring), Upirngaaq (Spring), Aujaq (Summer), Ukiaq (Fall), Ukiaksaaq (Early Fall) and Ukiuq (Winter). Jan took us to some Thule tent rings located right outside of the community. The Thule people [atoz/nomads](A.D.1000 - 1600) made their tent rings by collecting large rocks. This was then the base for their sealskin tent - the summer igloo. Warm-up is technically not until mid June and even stretching until mid July, but if you ask any Inuk they will say that spring is already here...or early Spring "Upirngaksaaq" as they call it. Traditionally, this is the time of the year where Inuit would break out from their winter camp and head for the rivers to fish and await the coming of the migrating birds, especially ducks and geese, which arrive in the millions. More seals were also caught as they would come up on the ice to enjoy the heat and to give birth to their young ones as well as when the seals would gather to travel down the rivers for fishing. With the long days, more food available to hunt, and great travel conditions, some would move back inland and others would go on long spring journeys to visit relatives, possibly ending up in favorite walrus feeding areas or maybe with a new wife from another group! Today in Gjoa Haven, Spring means going fishing on the Back River, seal hunting, and visiting relatives and friends in Baker Lake, Taloyoak, and some even all the way to Pelly Bay. After 8 to 10 months of snow and ice, Summer (Aujaq) was welcomed with great excitement. It is like an explosion from mid July to end of August when the temperature remains above freezing all through the 24 hour day ( though frost is possible at any time). The thawed soil above the permafrost is as deep as it is going to get. Birds are nesting, animals are plenty, and in the warmest month July, temperatures can become truly “Summery” often reaching into the 70's! This is the time of great "spread out.” Traditionally, small family groups traveled to follow and find caribou and muskox which were often hard to find at this time of the year after their spring migration. With lakes and wet areas dotting the landscape, the many mosquitoes made inland travel was rather difficult. In contrast to what you might think, inland travel was not easy at this time of the year. Main food staples were fish, small game, and migratory birds. Seals were also caught and stored for use late in the year. Meat and fish were dried by cutting the flesh into strips and setting them up to be dried by the sun and the wind. Today, summer still means "people spread out.” Gjoa Haven is pretty empty once school ends with most Inuit traveling inland to live in camps on the land for the summer. Teachers like Jan and Rita travel south on summer vacation! At the end of summer or early fall, (Ukiaksaaq) large groups came together for more communal activities such as fishing for char using weirs and hunting [atoz/eskimoicecream] caribou at the time when their coats were best suited for use as clothing and the meat was more palatable. This was crucial because it was necessary to ensure that enough hides were taken to provide a complete set of new winter clothing for the family. With the coming of squalls and bitingwinds, came Fall, Ukiaq. The end of August brought freeze up and people would head back to the traditional gathering places. Snow began to cover the land and small lakes and creeks would freeze. While moving towards their destination, intensive hunting took place. Caches of food were stored. Sewing of winter outfits began. With the sun getting lower and lower on the sky everyday, the ground looses heat, and traditionally, the transition from tents to snow houses would take place. Everything eventually freezes with the last being the sea. With the arrival of barges, (the sea lift - is a big tug boat with two, three or four barges) coming right into the bay with a year’s worth of supplies. The stores are resupplied with next year’s fuel, construction materials, boats, snow machines, and vehicles for the whole community. Rita and Jan buy a year’s worth of food supplies except meat and veggies! It is a huge event with the whole community relaying items from the containers on the barge to the store hoping to see all the goodies. Looking through next year’s catalogue begins within the next month! By mid September, it is winter (Ukiuq in Inuktitut) and the snow returns and lasts, of course, until mid June. The heaviest snow fall is usually in October. After that, the air gets too cold to be able to carry water vapor and most precipitation stops. Thereafter, the snow on the ground is constantly being rearranged each time the wind rises. Winter consists of the polar night when the sun never rises plus those periods in which, though the sun is above the horizon for some hours of the day, it isn't up long enough and doesn't rise high enough on the sky to have any real warming effect. The little bit of sun there is can not warm the earth as long as the surface is covered with brilliant white snow that reflects most of the potentially warming the solar energy back to the sky. Here in Gjoa Haven, the sun never rises from December 3 to January 9th. Traditionally with winter coming, large groups of extended families would head for the sea (except the caribou Inuit) to hunt marine mammals especially seals and walrus. Early winter was spent mostly seal hunting. Seal blubber was used to provide heat and cooking fuel and if possible would extra would be stored in skin sacks which could be used when living became difficult. Though it was a very hard time of the year, this was also when people got to spent most time with each other making the long time of darkness go by inside of the igloos playing games, story telling, drum dancing, and singing the traditional Inuit songs. Now a days, this is prime time for bingo, games, weekly games, and lots of sport tournaments! Tradition dictates that all finishers of a dogsled race are lifted up into the air on their sled. Here is Mary Kamookak the winner of yesterday's race. Last night was a beautiful evening with a warm breeze and people decided it was time for some games. There was a women's dogsled race, "fuel can racing" (you snowmobile race towing sled with a fuel barrel which is not tied down), down hill sled racing, and ice hole chopping contest! Today is another beautiful day and as soon as we push the send button, we will be heading out to pack the last bit on the sleds, hitch the dogs, and head out onto the Arctic Ocean.